Yesterday was officially Infant & Pregnancy Loss Awareness Day. 1. We think about it way more than once a year. 2. We need to talk about it more than once a year. 3. Things have been forever changed. Once a year only serves as a jump off point for those who need to heal from this kind of loss. Let me tell you, almost nothing in my life has been more traumatic than the loss of my first pregnancy. Discovering that I carried him, and the heartbreak of losing him all within a six week period impacted me hard, like falling into a cement block would. Yet this wee one, whose feet never touched the ground, had a positive impact upon me too. – He had made him (I believe his name is Andrew) and gifted us with him. -He was with me in Andrew’s conception, his growth and his departing. He never left my side through it all. I think often what life would have been like had Andrew made it to birth, and at every stage I have celebrated in wonder as my two miracles have grown before my very eyes. You see, I was so traumatized by losing my first child that I was literally a fear time bomb when I realized I was pregnant again, with my daughter. Yet God was so gracious in how He poured love, freedom and hope within me as He reassured me He was with me, every time I ran to Him & nestled into His embrace. I discovered joy in both my following pregnancies, despite my fear. My delivery of my daughter was a whole other drama (think about having a dozen witnesses!) but I made it through, and delighted in her arrival. My son’s delivery was scarier, yet God gave me a peace beyond comprehension that he was going to make it, and he did. Because I had been set free from the heartbreak of loss, I was able to whole hearted accept the gift He handed me. New life. All my children have been incredible gifts. One i will meet face to face beside Jesus. The other two I am honored to say I will have the pleasure of introducing to their sibling who went on ahead one heavenly moment yet to come. Sometimes when you have lost, in my case, the depth God went to to heal me from my miscarriage, you are blessed to have a heightened wonder at what you have been given afterwards. If you too have lost a child, in utero or after birth, my heart goes out to you. My heart has been made whole again despite my losses, grief and trials because its Maker has touched me and brought me back to life. My prayer is that you will allow Him to do the same. And may He rise up around you those who you can share your burden and grief with, who will direct you back to the Healer of all wounds, hurts & brokenness, as they love you alongside you in your loss. 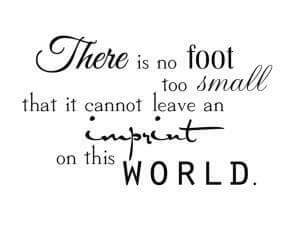 Yet Andrew’s tiny feet have left an imprint on my heart which will never leave, nor do I want them to. I am a better mom, more compassionate friend, and can find joy in the mundane of the day to day because I know that I know He is with me, each step, every moment. Losing Andrew and meeting God in the whirlwind of the emotion which followed taught me that.